So, what do you want to know about the 504 then? What are you looking for, for what weight and COG camera (make and model would be nice) and what's your budget? You'll need to be a tad more specific with your questions to get real answers here, I'm afraid. Have another shot at it. it seems as though the poster's in this thread are claiming the build quality of the heads mentioned leave a lot to be desired. Since I've posted this though, I have discovered that the 504 is not currently available. It doesn't seem as though anyone will be able to answer my question. You didn't actually ask one that was answerable! Lost my original reply so here is the less eloquent replacement. The white delrin ring and faces which compress it probably should be dry, not lubed, or if lubed at all, given a very thin coating of light grease or light machine oil. No sticky friction material should be on them. Even with light oil on the surfaces, a stiction effect may be present. At the widest diameter and at most mechanical leverage against your efforts to initiate tilt, this will be the source of your "stuck and breaks free" or stiction problem. My understanding is that the friction damping is a fixed constant effect and not adjustable in this tripod head. It seems that the white delrin ring and its clamping clutch faces are intended as a lock-off brake only and a partial seal against ingress of dust. My understanding is it is not intended to be used as a friction adjustment although it might appear to be effective when used that way. With time, use, storage or shipping in aircraft where pressures change and entrained airbubbles expand and force friction material to move out, migration of this material onto the delrin ring will likely have occurred. The outer channels of the concentrically finned area are tapered. During assembly they are probably left dry so that they accummulate friction material driven out of the inner channels during assembly and afterwards when compressed entrained airbubbles expand and push some more material out. Try cleaning the friction material off the white delrin ring and clutch faces with a safe solvent so they are completely dry. Rake out friction material from the two outermost channels of the concentric fins and restore this material to the inner channels. After initiall re-assembly, if there is enough friction lube still in there but there remains a notchy feel to the dampening, this may be due to entrained bubbles merging and letting a whole section run free momentarily. When they finish merging and become complete open channels separating complete bands of friction material, then the motion should settle. If the notching remains or the motion becomes almost frictionless, then more friction material may need to be added. I could be talking out of the nether region where the light of day should not normally find itself present but I think my suggestion may help you. Please prove me correct for the sake of my tender ego. bought my 501 head a few month ago. Just wondering, is the head suppose to last forever or do you have to open it up and grease it like some other members here did. seriously, bogen / manfrotto heads are crap. try a vinten or satchler and then you'll understand, but not until then. before you cry how "expensive" they are, consider that they are very well made, they are in fact rebuildable at the factory, and will last a lifetime if not excessively abused... oh and they work great. Been using my 501 head with WN3221 legs and 1/2 ball leveler for going on 7 years now without any problems. It is smooth enough for 95% of what I shoot. one more question. I keep hearing about this bowl head leveler thing. Does it come with the tripod or do I buy it separately? I have a photography tripod and it annoys the crap out of me that I have to adjust the legs to make it level. Stills tripods are designed for just that and are a poor substitute for a proper video half bowl tripod. The half bowl is built into the tripod itself, giving the receiver (the bit that attaches to the legs and head ) a totally different format to a stills tripod. To get a flat base head like the 501 to work with a half bowl video tripod you need to attach a Manfrotto half ball adapter, either a 75mm or 100mm, depending on what size bowl is in the tripod. The larger the bowl (they go up to 150mm, which is BIG!) usually the heavier and more rigid the tripod. The bolt protruding from the top of the adapter screws into the base of the flat bottomed head, then three retainer screws (not really visible in the photo but inside the adapter half ball when you buy it) are screwed into the bottom of the head to prevent it moving on the bolt. 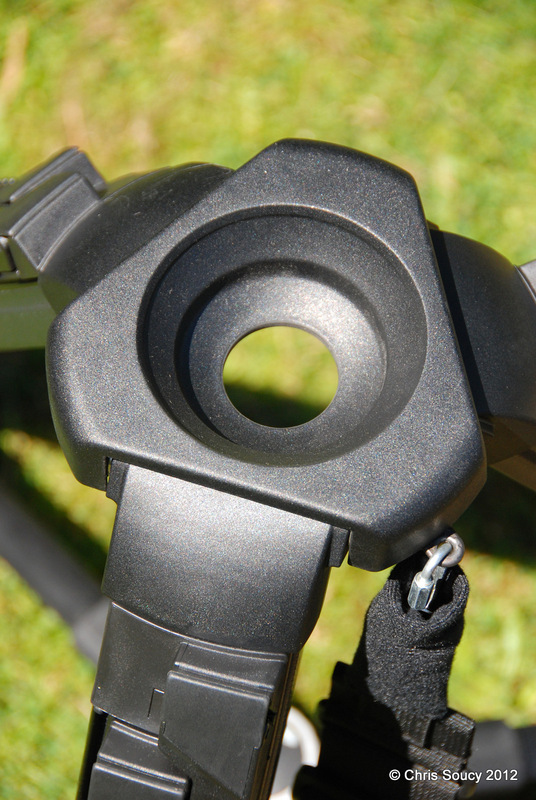 The long black thing at the bottom of the adapter is called the "clamp knob" and unscrews from a long bolt protruding from the bottom of the half ball. 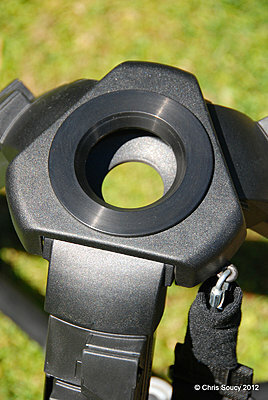 Once it is off, the bolt can be inserted (from the top) through the hole in the bottom of the half bowl in the tripod. The clamp knob is then screwed back onto the bolt from under the receiver.When slackened off it allows the head to be leveled completely independently of the reciever level, meaning fiddling with the legs is a thing of the past. I'm hesitant to suggest a suitable tripod, as I would need to know the payload it is required to work with and the available budget, should you wish to upgade. However, there is one thing that needs to be pointed out. You get what you pay for, and good (video) support gear isn't cheap. That 5% is the killer. Why don't you fire a mail to both Barbara.Jaumann@VitecGroup.com and Peter.Harman@VitecGroup.com and ask for a freebie try out of one of their systems (Sachtler & Vinten respectively). It's free and no obligation, just tell them what you're shooting with and it's "game on". Give you a feel for how the other half shoot. That offer is open to everyone by the way, you don't need a personal introducion from me, if you feel the need or are curious, go for it. Just beware, if you're currently shooting with a Manfrotto or stills system, you'd better lodge your credit card in the safe deposit box and give the key to a friend, with strict instructions not to return it under any circumstances, else you WILL buy one. PS; Just so you know what a half bowl tripod reciever looks like, here's two photos of a 100mm bowl unit. One is "as is", the other has a 100mm to 75mm reducing ring fitted to allow the use of a 75mm half ball base head. Last edited by Chris Soucy; April 30th, 2012 at 12:26 AM. chris do you have something against manfrotto? the only reason I use them is because they're lightweight and I like their quick release, manfrotto 577. so what tripod and head would you recommend? This is what you are looking for to mount between your tripod if it is a flat top type and the 501 head Manfrotto 438 Compact Leveling Head - Ball Camera Leveler 438 It works very well and takes about 3 seconds to level up. After a year or two be sure to periodically check the lever for tightness and screw looseness. Last edited by Mark Williams; April 30th, 2012 at 12:00 PM. The 501 is fine for "locked down" shots and for camera tilts and pans if you are doing wide or medium shots. It does take some practice to get smooth moves. At full telephoto its not good enough for smooth camera movements. I have used a borrowed Vinten and Miller tripod and they are fantastic pieces of equipment. However, I shoot in hazardous terrain and there is no way I am going to invest in a $$$ tripod that I could loose down a cliff or into a river. My Manfrotto 501 head and WN3221 legs have taken a whole lot of abuse over the years and have held up very well. They are not junk and anyone that tells you otherwise IMO is incorrect. In my book they are an excellent investment. I just hope that when mine is finally worn out I can find similar quality at a good price. Tripods/heads are a lot like cars. You can spend a little for Ford Feista or much more for a Porsche 911. They will both get you there but one with a lot more finesse than the other. I also have another cheap tripod (Davis & Sanford) http://www.amazon.com/Davis-Sanford-ATP-Terrain-without/dp/B001TUYUF6that I use to support a jib and motorized slider. It is very sturdy and has worked out well. Another great value. Last edited by Mark Williams; April 30th, 2012 at 01:32 PM. If only you told me this sooner. Uh, hum, er, you been living under a rock? Which bit of "the Manfrotto 5 series is a complete load of j&nk for poor videogs to waste money on" don't you get? I've been hammering it for the last 6 years, here, on DVinfo. Guess coming out from under that rock occasionally and reading the threads might have been instructive, what more do you expect anyone does - visit you at home? If you simply will not hear, and you've been here (on DVinfo), I've seen your posts, what else can anyone do? You, and countless thousands, have been told, in no uncertain fashion, DONT GO THERE, but they do, and constantly come back here complaining that they (the products) don't do what "the manufacturer promised". JOKE: Since when did you take a Nuclear Power Station management at their word with "we're safe?" Rider: In Japan? Three Mile Island? Hmm. You have been told, often, you chose to ignore it, what more can we do? I have absolutely zero sympathy I'm afraid, it's between you and Manfrotto, good luck. Good to see someone from Manfrotto actually 'fessed up here, now that is interesting, maybe they finally "gottit", but I won't hold my breath. .....for static, locked off shots. ....and when I won't be more than 2 feet away from it in case the whole shebang collapses.